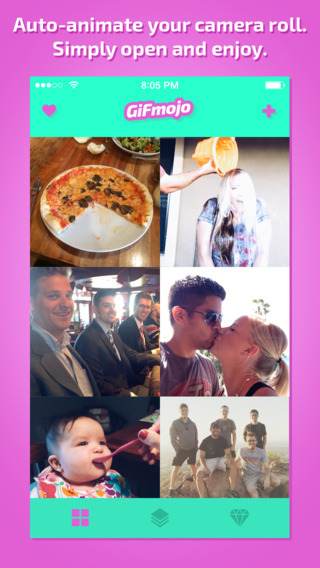 GiFmojo takes your iPhone’s camera roll and repeatedly punches it in the face until awesome animated gifs fall out. Then, it shares those hilarious gifs with your friends through text message (SMS), email, Instagram, loud screams, head nods, and smoke signals. That’s it - it’s not changing the world, it’s just making it a lot more fun. Oh, and you don’t even have to create an account to use it. Plus, it’s ad free AND is also free to download. Boom! Yeah, we know … You’re welcome. Check it. GiFmojo automatically creates animated gifs using all those awesome photos already in your camera roll. Yes, ALL the photos: those embarrassing, but hilarious, selfies; last months epic vacation pictures; yesterday night’s party party; or, those phhhoto booth pics you snapped in that other app. They all get animated instantly, the second you launch the app. - Save backup copies of each animation to your camera roll as a gif or video and share it to literally ANY social network or website you want to: Tumblr, Twitter, Facebook, 9gag, Reddit, or anywhere else! Email all your thanks and praise to get@GiFmojo.com … questions too, we suppose.